There is some superb research being undertaken into elements of the Irish diaspora at present, both at home and abroad. The site has been fortunate to feature a number of guest posts in the past highlighting some of this scholarly research. I am delighted to be able to share a fascinating post prepared for the site by Jerome Devitt, a PhD Scholar at Trinity College, Dublin. Jerome has been working on British counterinsurgency in Ireland in the immediate aftermath of the American Civil War, and has recently carried out substantial work on the fascinating Fenian connections with Bermuda. 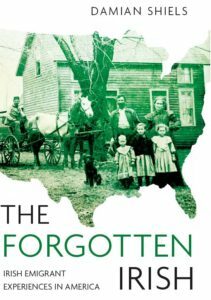 Jerome recently published on this topic in the latest Éire-Ireland and here distills for us his findings, and how they connect to Fenians in the United States– many of whom were Civil War veterans. The first reason most Irish people had to be aware of Bermuda came through literature. Thomas Moore, the “Bard of Erin” and author of The Last Rose of Summer, had spent time in 1804 working for the Admiralty on the island and his poem This Little Fairy Isle became very well known (partly because of scandal associated with some marital infidelity!). Moore became known as the “Unofficial Poet Laureate of Bermuda, but this was just the tip of the iceberg. Irish priests who served the Archdiocese of Halifax, Nova Scotia, formed the backbone of the Island’s Roman Catholic priests throughout the century, and numerous colonial administrators were rotated around the empire including Ireland and Bermuda. Perhaps the strongest link between the islands, however, came through the colonial penal system. The prison hulks that lay off the coast housed up to 1,500 transported criminals, almost 800 of whom were Irish and had been sent there during the famine. Their “lower stature and childish appearance,” evoked such pity from the Island’s Governor, Charles Elliot, that he separated them from other convicts and went as far as to find them apprenticeships! A prefabricated prison intended for Bermuda even ended up on Spike Island in Cork harbour! The most famous convict on the hulks, however, was John Mitchel, who was arrested in the build up to the 1848 Young Ireland Rising. 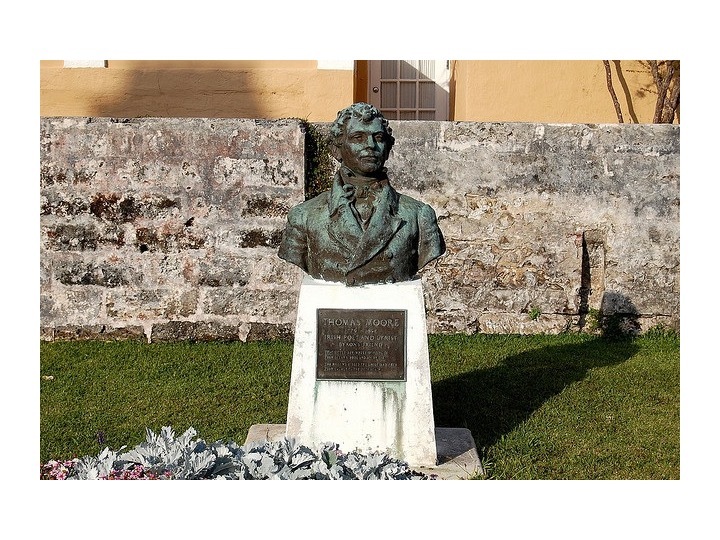 No sooner had Mitchel arrived at Bermuda in June 1848, however, than the Irish Republican Union was hatching plans from New York to liberate him from captivity. They hoped to use 2,000 veterans from the recent Mexican-American War to either liberate him, or distract the Royal Navy’s North Atlantic Squadron to allow for a landing in Ireland. Mitchel’s understanding of what was happening was limited, and was described in his subsequently published Jail Journal. Informants rushed to the British Consuls along the eastern coast of America who sprung into action and relied on the best British tactic of the time “Naval Deterrence”. 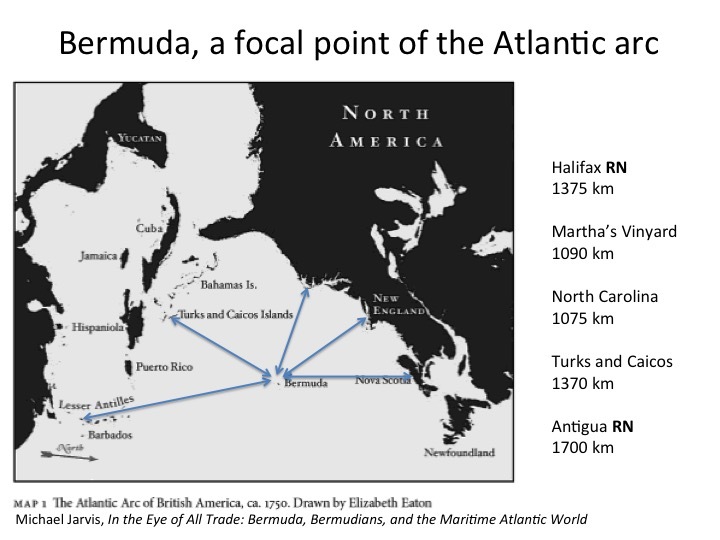 Ships from Halifax were dispatched to Bermuda and off the coast of New York to “let it be generally known” that British Authorities were aware of the plot. This proved enough to put off the potential plotters! If you’d like to find out more about how the Royal Navy prepared for possible American landings in Ireland in 1848 click here. all under the command of Lieutenant General Killian. 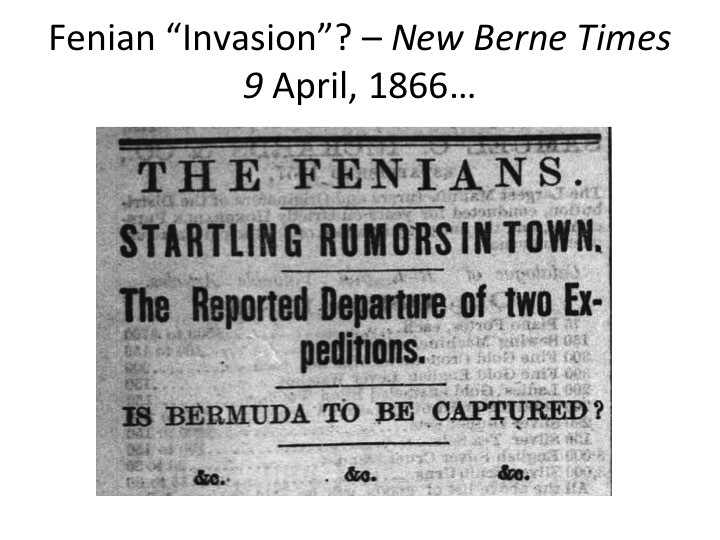 Most newspapers, both in America and Ireland eventually dismissed the seemingly foolish plan as the “Fenian Bermuda Hoax”, but inadvertently, the problem nearly became very real when the British Army sent its 61st Regiment (which had been infiltrated by the IRB in Ireland) to Bermuda later in the year to strengthen its defences! The disaster in Campobello rendered this plot dead in the water, but a definite pattern began to be established, whereby Bermuda was growing in importance in the minds of the Fenians. 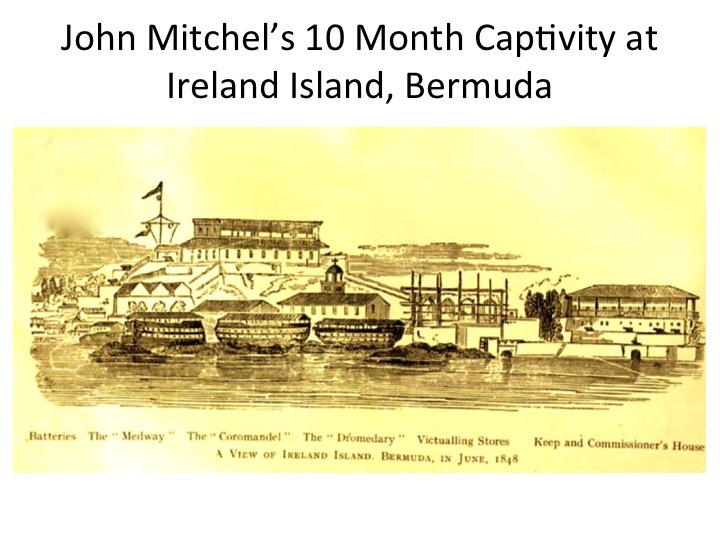 After eventually escaping captivity in Australia, Mitchel went on to broadcast that “a patriotic organization of Irishmen had at all times a clear right to attack English power, either in Canada or anywhere else” and the revolutionaries of the 1880s aimed to do just that in Bermuda. 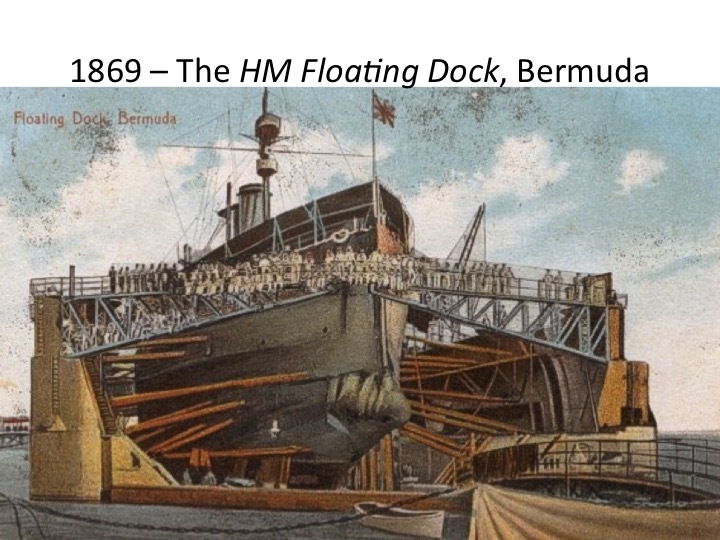 (3) Possibly the most impressive and significant piece of imperial infrastructure in the Atlantic was Bermuda’s world famous HM Floating Dock, which became a target for O’Donovan Rossa’s ‘Dynamiters’ in 1881/2. The dock had a displacement of 8,300 tons, an overall length of 381 feet, a width of 123 feet and was capable of lifting a 10,000-ton vessel clear out of the water for repairs, enough for all but the largest of the Royal Navy’s capital ships that were developed in the thirty years of the dock’s nearly continuous use from 1869. Information came to Consul Clipperton in New York from numerous sources stating that Edward O’Donnell and Thomas Mooney (already famous from the ‘Mansion House’ dynamite attack in London) were being dispatched to Bermuda to blow up the dock, causing a dramatic reinvigoration of the Island’s defences, and the mobilization of virtually the entire civil and military population to be on alert for potential attackers. 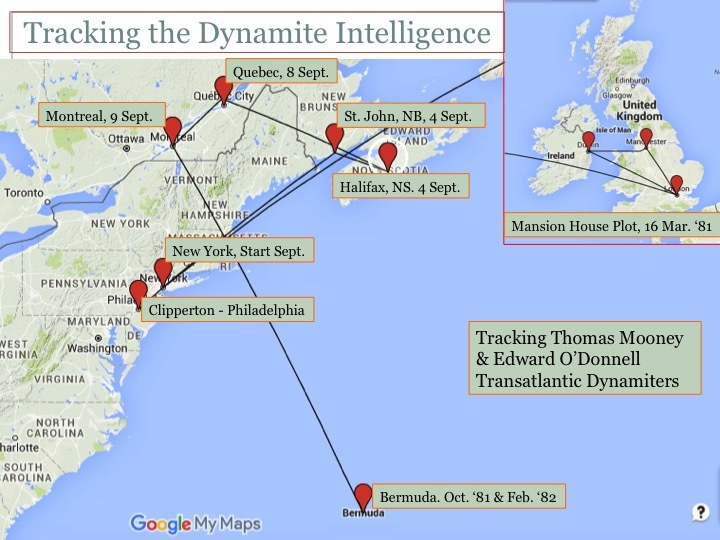 Here Ireland and Bermuda were linked through an Atlantic-wide intelligence system as the map below illustrates. What’s most interesting about this plot, however, is that it illustrates Irish involvement both within and in opposition to the British Empire. This is best illustrated by the fact that in 1882 Irish-Americans were attacking Bermuda, whose Lieutenant Governor was County Clare born Michael Laffan, who reported to a former Irish Lord Lieutenant in the Colonial Office (John Wodehouse, Earl of Kimberley – Irish Viceroy 1864-66), the island was garrisoned by the Royal Irish Rifles, who were in turn defending a naval base on Ireland Island, which was itself largely built by Irish convict labour!!! This, hopefully, demonstrates just how elaborate and complex Irish involvement in the British empire (and Bermuda in particular) was, and makes the simple reading of Irish-American Revolutionaries a little bit more interesting. Jerome Devitt is a final year PhD Candidate in Trinity College, Dublin. His thesis, “Defending Ireland from the Irish”, examines British Counterinsurgency in Ireland in the immediate aftermath of the US Civil War. It focuses on British military institutions and their efforts to deter and suppress transatlantic Fenianism. He is a secondary school teacher living and working in King’s Hospital boarding school just outside Dublin.If you’d like to find out more about the connections between Ireland and Bermuda and significantly more detail on the plots of the US Civil War veterans and the reaction to the plots, click here to read my article in the recent edition of the journal Éire-Ireland. (1) Peter Vronsky, Ridgeway: The American Fenian Invasion and the 1866 Battle That Made Canada (Toronto: Penguin Global, 2012). (2) Jill Bender, ‘The “Piniana” Question: Irish Fenians and the New Zealand Wars’, in Ireland in an Imperial World: Citizenship, Opportunism, and Subversion, ed. Michael De Nie, Timothy McMahon, and Paul Townend (Palgrave Macmillan, Forthcoming); Richard Davis, ‘The Prince and the Fenians, Australasia 1868-9: Republican Conspiracy or Orange Opportunity?’, in The Black Hand of Republicanism: Fenianism in Modern Ireland, ed. Fearghal McGarry and James McConnel (Dublin: Irish Academic Press, 2009), 121–34; Máirtín Ó Catháin, ‘“The Black Hand of Irish Republicanism”? Transcontinental Fenianism and Theories of Global Terror’, in The Black Hand of Republicanism: Fenianism in Modern Ireland, ed. Fearghal McGarry and James McConnel (Dublin: Irish Academic Press, 2009), 135–48. (3) New York Times, 2 February, 1867.